Having been pleasantly surprised by Prince Caspian, I found myself rather looking forward to The Voyage of the Dawn Treader considering that this was another direct follow-up story. There was a part of me made just a little wary though, due to a particular line in the blurb where it describes how Edmund and Lucy are accompanied by "their awful cousin Eustace". Just how awful were we talking here? The Voyage of the Dawn Treader follows the younger half of the four Pevensie siblings, Peter and Susan now apparently too old to journey to Narnia, and their stuck-up cousin as they are sucked into Narnia through a picture in their aunt's house. They find themselves reunited with Caspian, who has pledged to journey into the uncharted waters of the East, hoping to find the men who were driven away by his uncle several years before, and possibly even as far as finding the country where Aslan originates at the easternmost region of the world. 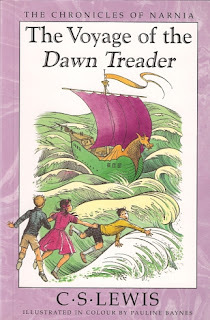 The Voyage of the Dawn Treader is an interesting one in comparison to the preceding book, specifically that they seem to swap strengths and weaknesses. While Prince Caspian was strong on plot but a bit disappointing when it came to vivid characters, Voyage of the Dawn Treader does some really solid characterisation and development arcs whereas the plot is choppy at best. I think I'll start with the plot, get that part out of the way. I think that the manner of the journey that is taken here severely limits what sort of coherence the plot and tone can have. Because the characters are essentially exploring uncharted waters, it's more or less a string of short stories as opposed to one overarching plot. Each of the individual story sections as they find a new island to explore is well crafted in and of themselves, but there is a definite stop-start sort of feel to the overall narrative because of the defined limits set by having each section on a separate island or stretch of sea. The deficiencies of the plot are definitely made up for though by the characterisation. The Voyage of the Dawn Treader does two things really well. First, Eustace has a great character arc, going from the kind of child that reminds me of all the reasons that I never want to be a parent, to a human being not automatically destined to become an obstructive bureaucrat. It's nice to see him learn from the bad consequences of his petty bullying, and realise that he might not actually be someone that people like and that maybe he isn't the one reasonable person in the group. Second, it made me sad that there isn't more of Reepicheep in the Chronicles of Narnia. Seriously, whatever I dislike about the plot or the writing style in this series, it's all made up for by the inclusion of Reepicheep. He's a giant talking mouse who acts more or less like an Errol Flynn character, whisker twirling and all. What's not to like? And while the fate that he gets does make me simultaneously smile and feel a little weepy, it makes me sad that he's unlikely to reappear in the series again. Everything needs more Reepicheep.